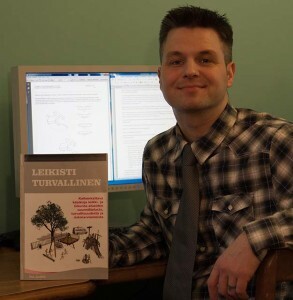 Esa Junttila graduated from Seinäjoki University of Applied Sciences with a bachelors degree in wood and construction technology in 2002 and began as R&D engineer in Lappset Group. Junttila’s mathematical talent was soon realized and challenges of product safety were given to him to solve. Lappset’s PlayCare service provided additional challenges from an inspection and maintenance point of view. Succeeding in this challenging task lead to a nomination as Product Safety Manager for the whole of Lappset Group in 2007. Now Lappset’s resources and willingness to be in the front row of the development of playground and recreational sports safety enabled participation in the development of safety in an international canvas. Participation included not only playground equipment, but also playground equipment with water, outdoor exercise equipment, multi-sport arenas and parkour facilities. Currently Junttila is a member of the EN 1176 interpretations panel and convener of a working group responsible for five out of eight EN 1176 standards. So far Junttila has published two books about design, maintenance, project management, and inspection of playground and recreational sports area safety. Beginning in 2015, cooperation with Lappset changed from employment to partnership. Today Junttila is largely known as an active expert across Europe.